The Universal Design Initiative in housing is the result of work undertaken by the Affordable Housing Committee of the City of Albuquerque. The Universal Design Subcommittee created a Universal Design Brochure to show home builders, architects, and consumers how to incorporate Universal Design features into the homes they build. The Universal Design Package offers more details and ideas about how to incorporate universal design features in your home. Universal Design incorporates features that increase the usability of the home by people of all ages, sizes, and abilities. A universally designed home enhances the ability of all residents to live independently in their own homes as long as possible. What is the Universal Design Initiative? In October 2001, the Affordable Housing Committee directed one of their members to form a Subcommittee that would begin a “community conversation” about Universal Design. The Subcommittee engaged a small group of builders, architects and a not-for-profit developer to participate in creating the Universal Design Package, the elements of which you will find in this brochure. For a minimal cost, this Package can be incorporated into the design of your home. In 2003, the Subcommittee recognized builders in the Parade of Homes who had incorporated universal design features into their homes. 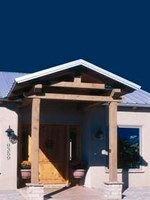 Beginning in 2004, the Home Builders Association of Central New Mexico made Universal Design a competitive category in the annual Parade. Does a house with Universal Design features look different from conventional housing? No. Some people think the homes seem more spacious, but these features are virtually unnoticeable. They simply allow the house to be adapted over a lifetime of changing needs. More than 66% of the housing in the United States is owned, and the majority of this is single family housing. Most of this housing has features that limit basic access, such as raised porches, steps at thresholds, and narrow bath­room doors. Retrofitting these features in a home is costly. Sometimes the home cannot be adapted sufficiently for the resident to remain in the home. Universal Design can change that, and incorporating these features at the building stage adds only a minimal cost to a new home. Universal Design makes a home friendly and easy to navigate for every­one. Steps at the front door pose an equal challenge to a stroller as to a wheelchair. Families are able to welcome relatives and friends with disabilities. Residents who develop disabilities are more likely to be able to remain in their homes rather than having to move or remodel. The resale of the home is enhanced because home buyers are attracted to homes that welcome their aging parents and provide easy use for themselves. Bernalillo County is home to 179,000 baby boomers. Baby boomers want to live well, comfortably, and in familiar surround­ings, and according to an AARP survey, 82% of them said they wanted to age in place. By 2030, the 65+ population will double, but 1/3 of that population is projected to live in poverty. Retrofitting the home of a person at the poverty level requires taxpayers to pay the cost. In contrast, the costs of universal design are paid by the home­owner through the monthly mortgage payment. If you have a disability and require special assistance to benefit from this program, please contact Thea Guerin at 768-2758 or email [email protected]. TTY users may access this number via the New Mexico Relay Network by calling toll-free: 1-800-659-8331. The City of Albuquerque acknowledges its continuing commitment to protecting individual’s rights and privileges. In accordance with this commitment, the City prohibits discrimination in the operation of Government on the basis of race, color, religion, national origin or ancestry, physical/mental disability, age, gender, Vietnam era or disabled Veteran status, marital status, sexual orientation, pregnancy or medical condition.